I like fancy dinners. I'm not intimidated by elaborate ingredient lists, long cooking hours or foods I've never heard of. I like a challenge. I like the satisfaction of enjoying something I've worked for. I like doing something that not just anyone can do. Well... that's most of the time. Sometimes, however, I just want to be lazy. I want three steps, three ingredients and three minutes until I can dig in. When that happens, I'm going to continue to turn to this recipe. Sweet and salty and creamy and crunchy, this bite size treat is a cinch to make and is perfect for an easy entertaining treat. If you have five minutes, you can make it. So hop to it Hey-Zues (Jim Gaffigan, anyone?). 2. Place pretzels on a baking sheet. 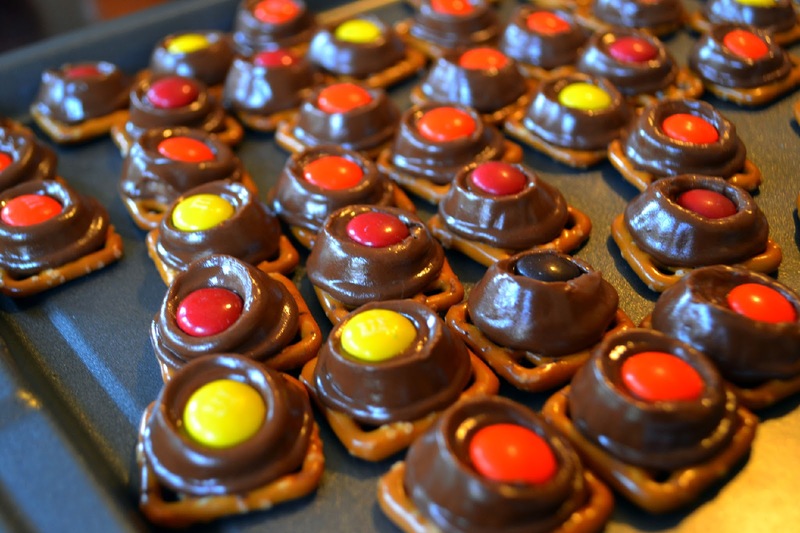 Put one rolo onto each pretzel and place into preheated oven for 3 minutes. Yummmm! I bet the kids would love to get it on this one. It's great because it has some "instant gratification!" I just made these the other day except I used Hershey kisses! I've also seen them with a Rolo and a walnut pressed on top. Yum!! Ahh how easy and delicious! Great idea!!! Easy and oh-so-sweet! I hope you had such a wonderful Thanksgiving with family/friends. Thank you for sharing yet another tempting treat with me. I'm about to eat dinner...which is good, because I'm hungry now! Hugs and love. These look so fun and festive! Perfect for a last minute idea to bring to a holiday party!